Craig Doucette joined the Nature Conservancy of Canada team in October 2018. 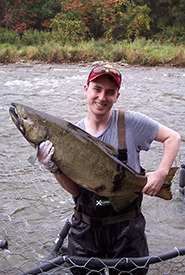 Fascinated by the connections between wildlife and the habitats they occupy, he studied wildlife biology and ecosystem management at the University of Guelph and Fleming College. In his down time, he enjoys playing fetch with his Labrador retriever, camping and hiking (especially when it means exploring off the beaten path).